i was texting with colin a lot yesterday, so i decided to try to spot some of his stuff on flickr, but instead i ended up with all this. 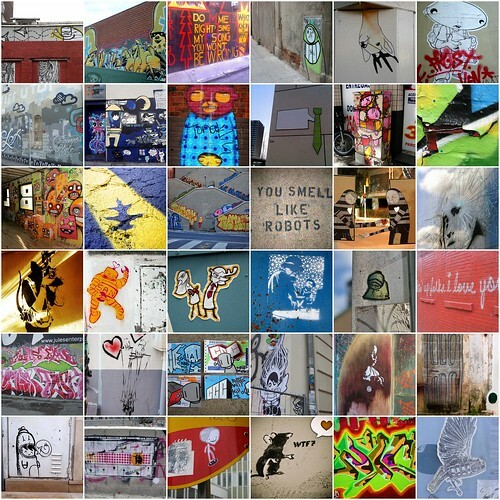 i love street art; graffitti, tags, stencils, wheat paste, labels, stickers. there is all kinds of beautiful, inspiring work just sitting out there on the street, on lamp posts and on signs, just waiting to be enjoyed. so, these are all ones that inspired me in one way or another. duuuuude, i know. im obsessed with tags and graff art. its so rad. i like getting stuck by trains, just so i can see all the cool stuff. so much of my flickr favs are street art, too. and "you smell like robots" ?!? awesome. genious. girl you always have the BEST flickr montages! Coolness. Love the mosaic especially the "you smell like robots." I think I'll text that to my brother later and see what he says. wow- i lurve street art- and stencil art, this mosaic is way cool- i agree with nicole above, that shot caught my eye 2!! awesome work girlie, checked out your sis- great work honey!! added u to my blog too!